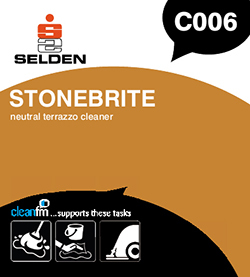 Specially formulated to clean and maintain terrazzo and marble. Completely neutral. Will not attack or discolour marble and terrazzo floors. Moderate foam, will not block suction driers, no rinsing required. Effective neutral cleaner for all surfaces, not just marble and terrazzo. Stonebrite is specially formulated to clean terrazzo and marble effectively without causing long term deterioration. Also suitable for quarry tiles, concrete and all non-porous surfaces. Composition An aqueous blend of emulsifiers, soil-suspending agents and sequesterants.